Mike Ashley has appeared to increase his control at Rangers as Sports Direct executive Barry Leach was appointed finance director. Leach, head of brands at Ashley's sportswear firm, has been acting as a consultant at Rangers since October. The 48-year-old joins another Ashley associate, Rangers chief executive Derek Llambias, in the Ibrox hierarchy. In October, Ashley's £2m loan to the Scottish Championship club allowed him to appoint two directors. Under a Scottish Football Association agreement, Ashley is not allowed boardroom influence or a shareholding of more than 10%. He currently owns 8.92% of the Rangers shares and his attempt to increase that stake to 29.9% was just before Christmas Day. 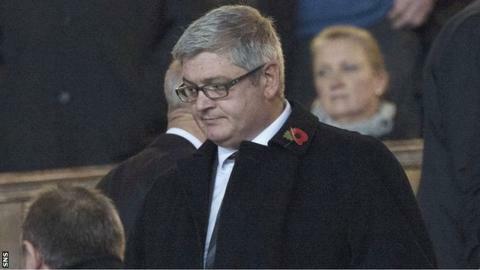 Ashley and Rangers face an SFA disciplinary hearing on 27 January over the businessman's dual ownership of Newcastle United and Rangers. The notices of complaint say Ashley and the club have failed to "act in the best interests" of football and Rangers have further been accused of not acting "with the utmost good faith" towards the SFA and its member clubs. Ashley has control of Rangers' shirt sales and retail division for the next five years. Rangers announced on Monday that they had secured from chairman of the football board Sandy Easdale to provide working capital. BBC Scotland learned the money was taken to pay National Insurance and to avoid the club being wound up by HM Revenue and Customs.